Today I have the pleasure of sharing a guest post from one of my best blogging friends, Abby of Little City Adventures. She is a wife and new mama, and happens to be awesome in the kitchen. I thought she would be the perfect person to share inspiration for a Whole30 approved recipe! Enjoy! Hello! I'm Abby, blogger and creator of Little City Adventures, a lifestyle blog about motherhood, food, daily life, and my favorite spots in Lancaster & Lititz, Pennsylvania. I've shared a recipe on Foreign Room in the past and Jess and I have collaborated a few times as well. And we have become great blogging buddies which inspired us to start Blog Buddies Network, a private Facebook group for female bloggers to support each other and meet up in real life! I was so excited when Jess texted me and asked me to create a recipe to go along with her Whole30 challenge. I think it's an awesome challenge and I'm proud of her for sticking to it! Once my family and I are settled into our new home I would like to do something similar, providing I can convince my husband to participate as well (ha). Jess sent me a long text listing all of the guidelines for Whole30 and said she was looking for a creative recipe, since she said she felt like she was basically making the same thing for dinner every night. So I started thinking. And decided that I wanted to make a dish that was versatile but full of flavor and easy to make. I chose chicken as the protein in the dish as it tends to be cheaper than other meats and I happen to have a nice stock of frozen chicken in my freezer at the moment. Let's be honest, the latter is the real reason that I used it in the dish. 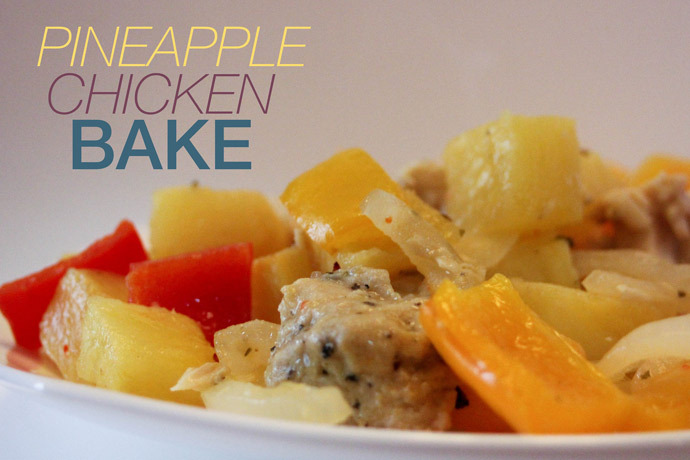 To keep the chicken moist and to add lots of flavor I decided to make a tropical-ish dish by baking it with pineapple. Delicious. I packed in few of my favorite bright ingredients and created what I think is a fun and yummy dish. You can eat this as is for a low calorie, Whole30 approved meal or you could go crazy and serve it over rice or stuffed in a tortilla with some sour cream and cheese. You could even get really crazy and rub some taco seasoning on the chicken before baking. 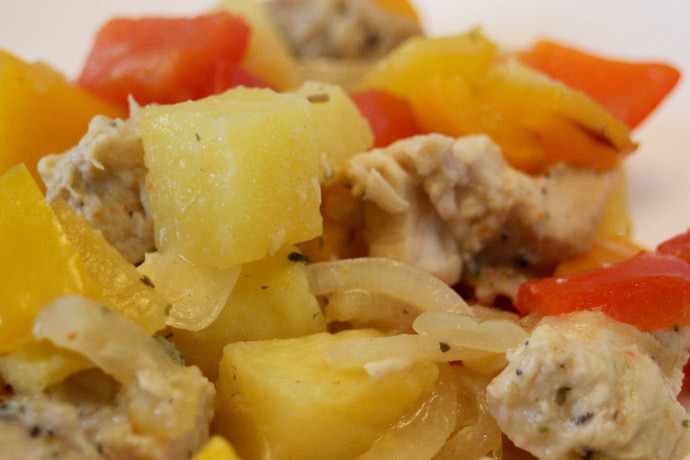 There are endless possibilities with this dish, which is kind of the best part. 1. Preheat oven to 400°F and prepare an 8 or 9 inch baking dish by drizzle olive oil on the bottom. 2. Drizzle a bit of olive oil on both of the chicken breasts and then rub with sea salt and pepper. 3. 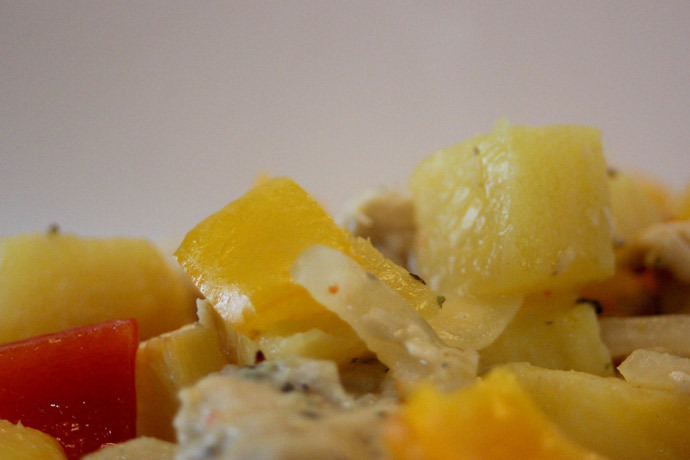 Toss all of the ingredients in the prepared baking dish. Cover the dish with parchment paper*, tucking it inside the dish so no edges are sticking out. Bake for 20 minutes. 4. After 20 minutes, remove the parchment paper and toss the ingredients. Place the dish back into the oven and bake, uncovered, for another 20 minutes. 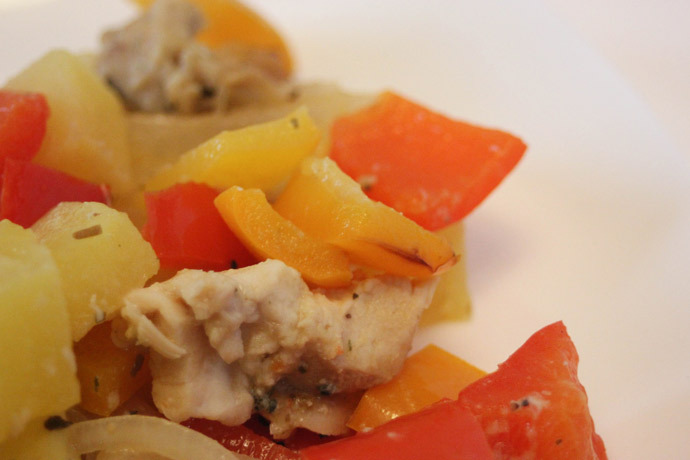 I hope you enjoy this Whole30-friendly recipe! If you cook it up or put your own spin on it, share it using #littlecitykitchen so that I can see it too. And thanks Jess, for thinking of me to share on your blog, it's always a pleasure to work with you. See you guys soon!